Shildon AFC are now just one win away from winning the Northern League championship after a nervy 3 – 1 home win against Durham City on Saturday 25th April 2015. The Railwaymen travel to Bedlington Terriers knowing three points will lift them the title for the first time since 1940. Shildon started nervously and went behind after just 8 minutes when Walid Abeid’s shot was punched out by keeper Lewis Graham for Ryan Noble to fire in the rebound. Shildon were level 10 minutes later when a Mark Doninger shot was handled in the box by Nathan Lawrence and Lee Scroggins converted the spot kick. Shildon settled down and started playing their normal passing game, taking the lead before the half hour when a JohnBrackstone cross found Billy Greulich-Smithj whose header was parried out by keeper Harkess for Billy to fire back into the roof of the net. Both keepers were kept busy with Shildon’s keeper saving from Patton and Durham’s from Paul Connor. On 45 minutes a curling shot from Durham’s Callum Patton hit the bar. The second half turned out to be the same as the first half, end to end stuff. 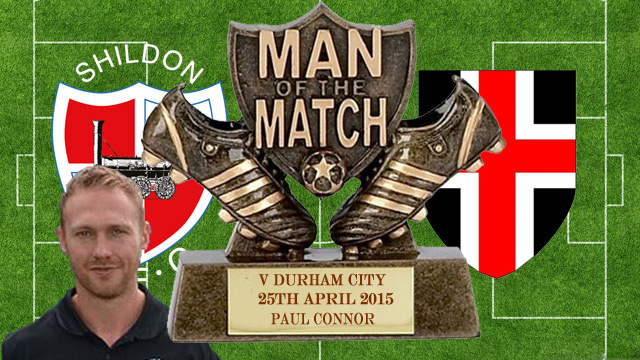 On 47 minutes a long range drive from Patton was headed off the line by Daniel Moore, before Shildon made it 3 – 1 when a left cross from Chris Emms found man-of-the-match Paul Connor whose perfect left foot shot beat keeper Harkess. Shildon’s keeper Lewis Graham made two further saves, with Shildon controlled the play during the last 15 minutes. Near the end Ben Wood hit the bar and Mark Hudson had a free header. Goalscorers: Scroggins 18, Greulich-Smith 27, Connor 55. Subs: Hodgson for Doninger 61, Wood for Emms 73, Richardson for Connor 89. After the match manager Gary Forrest said “We were a bit nervous at the start but we showed great spirit and got back to our normal game. We still have one game to play and we haven’t won anything yet. We need to stay focused and adopt the same attitude as we’ve been showing during the last few games”.